Aftershok, and Ohio based classic heavy metal band, is back for round two. On the heels of their excellent debut, Unfinished Business, the band is back with the sophomore album, Burning Chrome. Forget about a sophomore jinx, this album picks up right where the debut left off. No frills, riff driven heavy metal is what's on the menu here, and it does not disappoint in the least. From the opening track, Sons if Thunder, it is evident that Aftershok sounds extremely tight and is ready to deliver a hell of a punch. The opening riff is thunderous, yet sharp as a knife. There's nothing like hearing a wall of sound hit you as the leadoff track. Vic Hix (Shok Paris' vocalist) hasn't missed a beat over the years. His range and power is in tip top shape, seemingly defying age. For those of you not familiar with Vic Hix, his voice has a distinct Dio like quality, with a slight operatic flare. As I progress through this disc, I hear notable improvements over the debut (which was already a good album). First of all, the guitars sound thicker. The bass presence seems a little bit more pronounced, and the addition of some duel leads and solos is a very welcome addition. This adds depth and a degree of variety to the sound. I must say that the riffs on Burning Chrome as a whole come across with a lot more authority than on the debut. As far as the guitar work goes, I couldn't have asked for better output from this band on this album. Even my girlfriend, someone who isn't a huge metal fan by any means, commented at how tight this band sounds when I had it playing the other day. Aftershok have taken a good thing and turned it into something that is an outstanding treat for the ears. Aftershok have shifted the balance of up tempo / mid tempo songs to favor the up tempo songs more on this album. That is another plus in my book. As a result, I think the band has found the perfect balance with this album. An album full of nothing but full throttle tracks could easily become predictable. 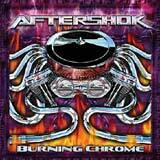 Aftershok have mixed a few well played mid tempo tracks in with their mainstay of powerful, metal anthems. Given the ability the band has to deliver catchy, yet pounding riffs and flamboyant solos, the up tempo songs seem to be the band's strong suit, and they have capitalized on this without becoming stale. Mid tempo cuts such as Dream Maker, When Comes the Rain, and the Sabbath like The Gathering still manage have a bite and attitude, thanks to some slower, yet deliberate and heavy riffs. Vic Hix never relents behind the mic. He really puts every ounce of energy into his singing, without over singing or trying to venture beyond his range. His voice adds a lot of character to the songs, and his powerful, melodic delivery is a perfect match to the powerful, yet catchy music behind him. If you like what bands such as Judas Priest, Saxon, and Dio have done in the past, I think you will find an awful lot to like here. Of course, fans of Shok Paris can blindly buy this album too. Burning Chrome is a very consistent album that is very easy to listen to repeatedly. Each song is catchy in its own way, and the songs are varied enough to keep the album fresh until the very end. The guitar work and vocal work of Vic Hix emanates with energy and passion that can't be rehearsed or learned. You can hear in the band's sound that the guys truly love the music they are playing, and put in every ounce of effort to deliver a quality product. Aftershok aren't trying to delivery anything new to the scene, just something good. Having said that, consider this album a success. It's too bad this band performs live only in the Cleveland, OH region. I'm sure an Aftershok live show is jumping, and I'd like to see first hand.